« Mix Creative turns 1! Use anniversaries as a time to review your accomplishments and set goals for the coming year. Trumpet your accomplishments! Update your website or send an e-newsletter to let clients know about important goals you’ve met, and how that benefits them. Customers and new prospects like to know they’re doing business with experience and know-how. Been in business 10, 15, 20 years or more? Congratulations, you must be doing something right! Don’t assume your customers know your company’s successful history. Create an anniversary version of your logo or add a tagline to use in your marketing materials. Use it on employee t-shirts, buttons, or other promotional items too. Have a party! Hold an open house for your customers at your space. Thank them in person for their business. Create Anniversary Promotions. Hold a sale, have a coupon, or even a prize drawing to celebrate. Make sure to advertise the promotion: Send a direct mail postcard to your, follow up with a print ad and create an announcement on your website’s home page. Take advantage of free publicity. Send a press release to publications your customers or prospects subscribe to. Be creative and make it interesting to get it picked up. Try a publicity stunt: hold a contest to make sculptures out of your product, or perhaps create a giant version of your product. 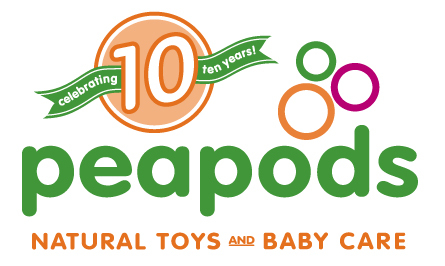 Mix created a 10-year anniversary logo for Peapods Natural Toys and Baby Goods. This entry was posted on Wednesday, September 3rd, 2008 at 2:30 pm and is filed under Marketing your Business. You can follow any responses to this entry through the RSS 2.0 feed. You can leave a response, or trackback from your own site.